Registration Form is at the bottom of the page. Our annual Goat and Hair Sheep Field Day will be held on Saturday, April 27, 2019 at the Langston University Goat Farm with registration beginning at 8:00 a.m. This year's theme will be Holistic Approach and our featured speakers will be Ms. Gianaclis Caldwell and Dr. Ann Wells. Ozark Pasture Beef (http://www.ozarkpasturebeef.com) is a partnership of farms that are all committed to producing beef in a natural, environmentally sustainable manner. Their web site states "Our beef and lamb is 100% grassfed and grass finished throughout their lives. We graze the cattle and sheep on lush, green grass, allowing for time and mother nature to provide us with a healthy, quality animal to produce quality beef for your family." It's what's on the Inside that Counts: Exploring the Anatomy and Physiology of the Goat (Part I) with Ms. Gianaclis Caldwell (1:30 p.m.). It's what's on the Inside that Counts: Exploring the Anatomy and Physiology of the Goat (Part II) with Ms. Gianaclis Caldwell (2:30 p.m.). It's what's on the Inside that Counts: Exploring the Anatomy and Physiology of the Goat (Part III) with Ms. Gianaclis Caldwell (3:30 p.m.). Fitting and Showing for Youth and Adults - tips and pointers on fitting and show ring etiquette (this is a half-day afternoon workshop). IMPORTANT!! Adult participants will attend a general morning session, which will start at 9:00 a.m., and will be able to attend three breakout session in the afternoon. Please select your afternoon workshops. 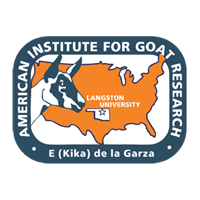 The Langston University E (Kika) de la Garza American Institute for Goat Research provides the opportunity for human kids to explore and enjoy “old-fashioned fun activities” while their parent(s) participate in the Goat Field Day Program. With all of today’s technological gizmos from the iPod to high-end smart phones and handheld games, most kids are no longer exposed to the old-fashioned games and activities that shaped the imaginations and innate creativity of their parents and grandparents. The Goat Field Day for Kids Program is intended to challenge and enhance cognitive and social skills. The development of intellectual and socialization practices have been determined as prerequisites for helping children to learn more complex concepts, thereby enhancing their personal capabilities. This year, we will also be hosting a ½-day Fitting and Showing Clinic in the afternoon, which will focus on learning how to properly prepare your goat for showing, will be held. Participants will be able to acquire tips and pointers on fitting and show ring etiquette. PLEASE CONTACT TERRY GIPSON AT (405) 466-6126.